ROMANUS at thirty-five years of age left his relatives and spent some time in the monastery of Ainay at Lyons, at the great church at the conflux of the Saône and Rhone which the faithful had built over the ashes of the famous martyrs of that city; for their bodies being burned by the pagans, their ashes were thrown into the Rhone, but a great part of them was gathered by the Christians and deposited in this place. Romanus a short time after retired into the forests of Mount Jura, between France and Switzerland, and fixed his abode at a place called Condate, at the conflux of the rivers Bienne and Aliere, where he found a spot of ground fit for culture, and some trees which furnished him with a kind of wild fruit. Here he spent his time in praying, reading, and laboring for his subsistence. Lupicinus, his brother, came to him some time after in company with others, who were followed by several more, drawn by the fame of the virtue and miracles of these two Saints. Their numbers increasing, they built several monasteries, and a nunnery called La Beaume, which no men were allowed ever to enter, and where St. Romanus chose his burial-place. The brothers governed the monks jointly and in great harmony, though Lupicinus was the more inclined to severity of the two. Lupicinus used no other bed than a chair or a hard board; never touched wine, and would scarcely ever suffer a drop either of oil or milk to be poured on his pottage. In summer his subsistence for many years was only hard bread moistened in cold water, so that he could eat it with a spoon. His tunic was made of various skins of beasts sewn together, with a cowl; he used wooden shoes, and wore no stockings unless when he was obliged to go out of the monastery. 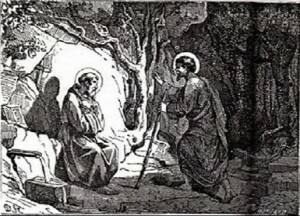 St. Romanus died about the year 460, and St. Lupicinus survived him almost twenty years.